For other uses, see Phrase (disambiguation). In everyday speech, a phrase may be any group of words, often carrying a special idiomatic meaning; in this sense it is roughly synonymous with expression. In linguistic analysis, a phrase is a group of words (or possibly a single word) that functions as a constituent in the syntax of a sentence, a single unit within a grammatical hierarchy. A phrase appears within a clause, but it is possible also for a phrase to be a clause or to contain a clause within it. There is a difference between the common use of the term phrase and its technical use in linguistics. In common usage, a phrase is usually a group of words with some special idiomatic meaning or other significance, such as "all rights reserved", "economical with the truth", "kick the bucket", and the like. It may be a euphemism, a saying or proverb, a fixed expression, a figure of speech, etc. In grammatical analysis, particularly in theories of syntax, a phrase is any group of words, or sometimes a single word, which plays a particular role within the grammatical structure of a sentence. It does not have to have any special meaning or significance, or even exist anywhere outside of the sentence being analyzed, but it must function there as a complete grammatical unit. For example, in the sentence Yesterday I saw an orange bird with a white neck, the words an orange bird with a white neck form what is called a noun phrase, or a determiner phrase in some theories, which functions as the object of the sentence. Theorists of syntax differ in exactly what they regard as a phrase; however, it is usually required to be a constituent of a sentence, in that it must include all the dependents of the units that it contains. This means that some expressions that may be called phrases in everyday language are not phrases in the technical sense. For example, in the sentence I can't put up with Alex, the words put up with (meaning 'tolerate') may be referred to in common language as a phrase (English expressions like this are frequently called phrasal verbs) but technically they do not form a complete phrase, since they do not include Alex, which is the complement of the preposition with. In grammatical analysis, most phrases contain a key word that identifies the type and linguistic features of the phrase; this is known as the head-word, or the head. The syntactic category of the head is used to name the category of the phrase; for example, a phrase whose head is a noun is called a noun phrase. The remaining words in a phrase are called the dependents of the head. By linguistic analysis this is a group of words that qualifies as a phrase, and the head-word gives its syntactic name, "subordinator", to the grammatical category of the entire phrase. But this phrase, "before that happened", is more commonly classified in other grammars, including traditional English grammars, as a subordinate clause (or dependent clause); and it is then labelled not as a phrase, but as a clause. Most theories of syntax view most phrases as having a head, but some non-headed phrases are acknowledged. A phrase lacking a head is known as exocentric, and phrases with heads are endocentric. Some modern theories of syntax introduce certain functional categories in which the head of a phrase is some functional word or item, which may even be covert, that is, it may be a theoretical construct that need not appear explicitly in the sentence. For example, in some theories, a phrase such as the man is taken to have the determiner the as its head, rather than the noun man – it is then classed as a determiner phrase (DP), rather than a noun phrase (NP). When a noun is used in a sentence without an explicit determiner, a null (covert) determiner may be posited. For full discussion, see Determiner phrase. Another type is the inflectional phrase, where (for example) a finite verb phrase is taken to be the complement of a functional, possibly covert head (denoted INFL) which is supposed to encode the requirements for the verb to inflect – for agreement with its subject (which is the specifier of INFL), for tense and aspect, etc. If these factors are treated separately, then more specific categories may be considered: tense phrase (TP), where the verb phrase is the complement of an abstract "tense" element; aspect phrase; agreement phrase and so on. Further examples of such proposed categories include topic phrase and focus phrase, which are assumed to be headed by elements that encode the need for a constituent of the sentence to be marked as the topic or as the focus. See the Generative approaches section of the latter article for details. Many theories of syntax and grammar illustrate sentence structure using phrase 'trees', which provide schematics of how the words in a sentence are grouped and relate to each other. Trees show the words, phrases, and, at times, clauses that make up sentences. Any word combination that corresponds to a complete subtree can be seen as a phrase. 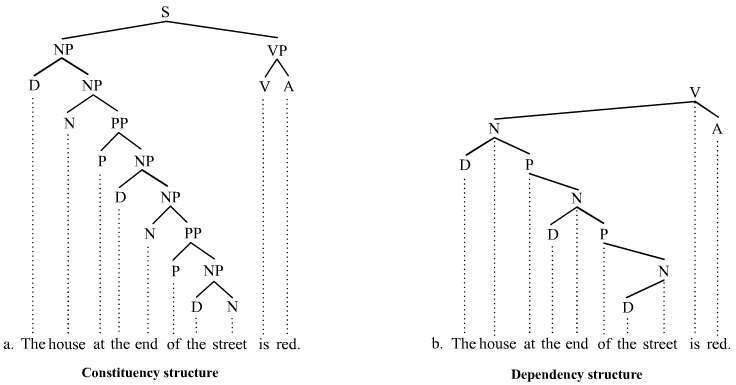 The tree on the left is of the constituency-based, phrase structure grammar, and the tree on the right is of the dependency grammar. The node labels in the two trees mark the syntactic category of the different constituents, or word elements, of the sentence. In the constituency tree each phrase is marked by a phrasal node (NP, PP, VP); and there are eight phrases identified by phrase structure analysis in the example sentence. On the other hand, the dependency tree identifies a phrase by any node that exerts dependency upon, or dominates, another node. And, using dependency analysis, there are six phrases in the sentence. The trees and phrase-counts demonstrate that different theories of syntax differ in the word combinations they qualify as a phrase. Here the constituency tree identifies three phrases that the dependency tree does not, namely: house at the end of the street, end of the street, and the end. More analysis, including about the plausibilities of both grammars, can be made empirically by applying constituency tests. The common use of the term "phrase" is different from that employed by some phrase structure theories of syntax. The everyday understanding of the phrase is that it consists of two or more words, whereas depending on the theory of syntax that one employs, individual words may or may not qualify as phrases. The trees in the previous section, for instance, do not view individual words as phrases. Theories of syntax that employ X-bar theory, in contrast, will acknowledge many individual words as phrases. This practice is because sentence structure is analysed in terms of a universal schema, the X-bar schema, which sees each head as projecting at least three levels of structure: a minimal level, an intermediate level, and a maximal level. Thus an individual noun (N), such as Susan in Susan laughed, will project up to an intermediate level (N') and a maximal level (NP, noun phrase), which means that Susan qualifies as a phrase. (The subject slot in the sentence is required to be filled by an NP, so regardless of whether the subject is a multi-word unit like the tall woman, or a single word performing the same function, like Susan, it is called an NP in these theories.) This concept of the phrase is a source of confusion for students of syntax. Many other theories of syntax do not employ the X-bar schema and are therefore less likely to encounter this confusion. For instance, dependency grammars do not acknowledge phrase structure in the manner associated with phrase structure grammars and therefore do not acknowledge individual words as phrases, a fact that is evident in the dependency grammar trees above and below. The constituency tree on the left shows the finite verb string may nominate Newt as a phrase (= constituent); it corresponds to VP1. In contrast, this same string is not shown as a phrase in the dependency tree on the right. Observe that both trees, however, take the non-finite VP string nominate Newt to be a phrase, since in both trees nominate Newt corresponds to a complete subtree. Since there is disagreement concerning the status of finite VPs (whether they are constituents or not), empirical considerations are needed. Grammarians can (again) employ constituency tests to shed light on the controversy. Constituency tests are diagnostics for identifying the constituents of sentences and they are thus essential for identifying phrases. The results of most constituency tests do not support the existence of a finite VP constituent. ↑ For a good introduction and discussion of phrases and the tree structures that represent phrases, see Sobin (2011:29ff.). ↑ Finch (2000:112) sees a phrase consisting of two or more words; individual words do not count as phrases. ↑ Concerning the inability of most constituency tests to identify finite VP as a constituent, see Miller (2011:54f.) and Osborne (2011:323f.). Finch, G. 2000. Linguistic terms and concepts. New York: St. Martin's Press. Kroeger, Paul 2005. Analyzing grammar: An introduction. Cambridge University Press. Miller, J. 2011. A critical introduction to syntax. London: continuum. Osborne, Timothy, Michael Putnam, and Thomas Gross 2011. Bare phrase structure, label-less structures, and specifier-less syntax: Is Minimalism becoming a dependency grammar? The Linguistic Review 28: 315-364. Sobin, N. 2011. Syntactic analysis: The basics. Malden, MA: Wiley-Blackwell. Look up phrase in Wiktionary, the free dictionary. Phrases.net - A large collection of common phrases that can be heard and translated to several languages. Phras.in - An online tool that helps choosing the correct phrasing, based on web results frequency. phraseup* - A writing assistant that helps with completing sentences by finding the missing words we can't recall. Fraze.it - A search engine for sentences and phrases. Supports six languages, filtered by form, zone, context, etc.